The ballet was performed twice in March 1963. 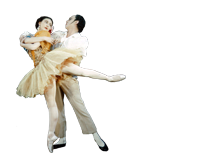 The programmes give its subtitle as 'lyric suite for two dancers and attendants', but also list the work as a pas de deux. Neither gives 'attendants' among the characters.